The mains look really small and awkward. Why put in a middle expo to then make it unusable with a Khaydarin? 1) I've checked 8 and 11 o'clock by putting Terran buildings in it with a normal turret ring around it. I could fit in: 24 depots (with CC this is 202 supply), 3 facs with addon and 8 additional ones without addon, 6 turrets equally distributed around the water edges, 2 armories, 1 academy, 1 barracks, 1 engineering bay, 1 starport with addon, 1 science facility. You need a proper sim city, but it fits. this equals a late game terran base, which needs at least 3 gas mains to pay for all the stuff. On this map, if you have a 3rd gas, you also have a second main, which gives you additional space for all the stuff that I just mentioned. 2) making the main bigger would mean to move the naturals more to the center, which would put them too close to each other. you could then tank-shot from one nat to the other, which is an anti-feature in my eyes (and something that I hate about e.g. Hunters). 3) another option to give more space would be to make the water-lines on the edges thinner. but this would make it possible to shoot from one base to the other with siege-tanks. that's another anti-feature that I hate about e.g. Hunters, so I wanted to avoid that. can you explain that more? For me, it is perfectly fine. enough space around the main building and a "main area" where you can put most of the production facilities. Keep in mind that you have to squeeze 8 mains on 128x128. You don't have the luxury of a standard 4 player map where you can make round shaped mains. yeah I fucked that one up. :D Didn't know it's indestructible when playing. I can exchange it for a Terran reactor or something. The main idea behind it was that you can't take this base in early game. But I guess this won't happen anyways, so I can remove any obstacle there and keep it empty. Will remove that part and update it. After playtesting, I got some feedback concerning the playstyle. 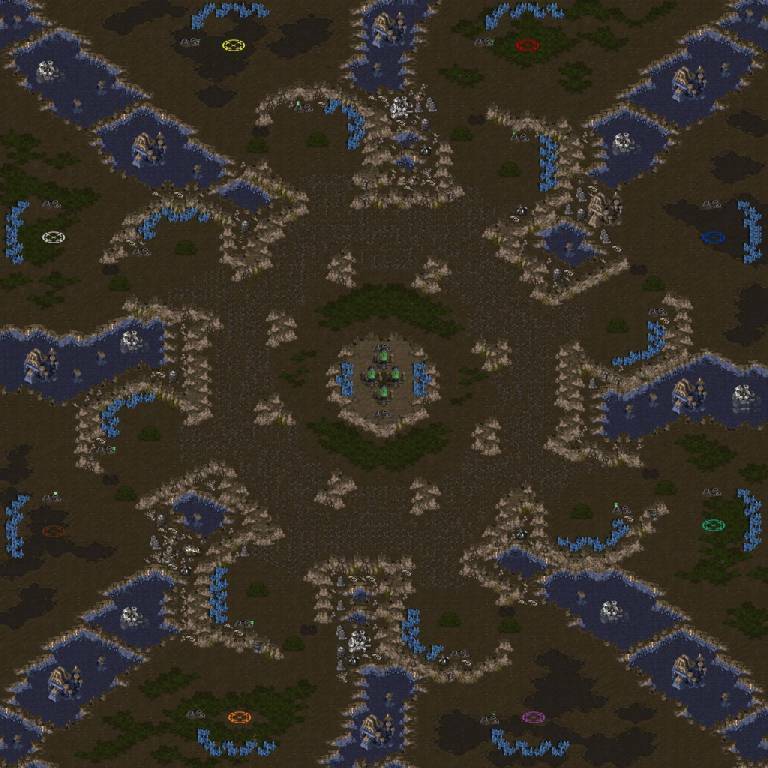 - Middle is now high-ground island expo with 4x Protoss Stasis Cells; This way, the expo can only be taken in mid-/late-game and terran cannot float e.g. a factory for tanks there. - added highground walls in front of all natural chokes so paths get split. - increased resources count for minerals in mains and center from 1500 to 2500, and gas from 5000 to 8000; naturals are still 1500 minerals and 5000 gas. Played few games today with these changes and it was much more fun! :) I'll upload the replays here.